Objective: To investigate the possibility of micronutrient dilution by alcohol in the diets of an adult population in nutrition transition. Design: A cross-sectional, comparative, population-based study. Setting: The African population of the North West Province, South Africa. Subjects: One thousand seven hundred and fifty-seven participants (742 men, 1 015 women) aged 15 years and older from 37 randomly selected sites from rural and urban areas. Outcome measures: Outcome measures included alcohol consumption at different levels of urbanisation. Nutrient intakes in different alcohol intake categories (abstainers, light-to-moderate, and heavy drinkers) and body mass indices of men and women, separately. 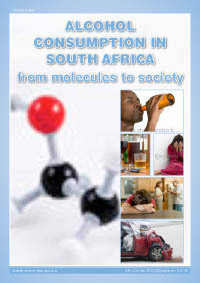 Results: Sixty-one per cent of men and twenty-fi ve per cent of women reported alcohol consumption. Mean daily alcohol consumption of light-to-moderate drinking men (< 30 g per day) and women (< 15 g per day) were 8.3 g and 3.7 g respectively and 80.4 g and 36.6 g for “heavy drinkers”, defined as men consuming more than 30 g alcohol/day (18% of the study population) and women who drank more than 15 g alcohol/day (6% of the study population). Sorghum and commercial beer were the most popular alcoholic beverages. Alcohol intake increased from rural to urban middle class, with a shift from sorghum to commercial beer with urbanisation. Men consuming the most alcohol had significantly higher mean intakes of most macro- and micronutrients. For both men and women only the percentage of energy from fat decreased significantly as the alcohol intake increased. The intake of some micronutrients did not meet the Dietary Reference Intake (DRI, Estimated Average Requirement, EAR) at all levels of alcohol consumption. However, the DRIs for pantothenic acid, biotin, magnesium and zinc were met only in men consuming the most alcohol. There was no significant difference in BMI across the different alcohol consumption categories although the total energy intake increased with an increase in alcohol consumption. Conclusion: In this population in transition, urbanisation increased the consumption of alcoholic beverages. Mean energy intake from alcohol of heavy-drinking men (18.1% of total energy, TE) and women (11.7% of TE) was signifi cantly higher than in the other groups but this did not cause an overall micronutrient dilution effect. It seems that respondents who have the money to buy alcoholic drinks can possibly also afford more healthy and nutritious food.